Latin America has been (and still is) the hardest-hit region by the War on Drugs. It shouldn’t come as a surprise that it is the part of the world with the most vigorous debate about drug policy reform as governments look for alternatives to the failed policies of the War on Drugs. The debate is hampered by the long-entrenched prohibitionist credo and extreme pressure from the big Northern neighbor. According to Mexican president Felipe Calderon though, there was only one consensus at the April 15th Summit of the Americas: that the drug policy debate needs to be open to all alternatives. Long confined to somewhat rarefied academic circles and the ultra-select ex-presidents club, the debate has now moved into the mainstream and is regularly capturing headlines; the taboo has been broken. Presidents don’t wait anymore for retirement before speaking out and discussion is finally leading to action. Even church leaders and Archbishops are joining the drug-reformist camp. Last January, Guatemalan president Otto Perez Molina famously threw a stone in the war on drug murky pound and has stuck to his guns ever since. He boldly threw the debate into the April OAS meeting and is now ready to present his controlled regulation proposal to the 76th UN assembly in New York on September 26. He plans to use the platform to further advance the idea with other heads of state. Meanwhile, the OAS (Organization of American States) will invest $2.4 million to investigate alternatives to the current fight against drug-trafficking and study the feasibility and the potential social and economic impact of legalization. A commission of experts will present its finding at the OAS General Assembly, in Antigua, close to Guatemala City, where the Perez Molina’s proposal will be discussed in details. It is of course anybody’s guess of what will be left of the committee’s recommendations after its report has been revised by the US and Canadian censors. 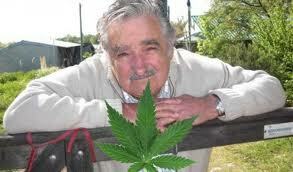 Tiny Uruguay, often dubbed the Switzerland of Latin America, threw itself on the map last June when President Jose Mujica and his government announced their intention to legalize marijuana under state control. The marijuana legalization project is now in the parliamentary pipeline and is being debated as we speak. What is remarkable here is that both the governing party (Frente Amplio) and its opposition (Partido Nacional) both agree on the failure of prohibitionism around the world. Of course, for people living in the US, it is unthinkable that democrats and republicans may agree on anything beyond blind allegiance to the failed War-on-Drugs policies. But if they agree on the diagnostic, the two parties diverge on the cure. It should be noted that marijuana regulation has been on the Uruguayan parliamentary agenda in one form or another for almost two years, with various schemes being debated, including legalizing the cultivation for personal use and the current proposal for state regulation. With a population of barely 3.5 million, Uruguay has the highest per capita income, highest literacy rate and lowest crime rate in Latin America, but it had the recent misfortune to be located on one of the new transit routes to Europe via West Africa and has been somewhat plagued by an invasion of pasta (cocaine-base). No need to say, Mujica’s proposal is generating a vigorous debate within the country and raising eyebrows and getting close attention in the surrounding countries, especially Argentina, Brazil and Colombia. Argentina and Brazil are debating decriminalization of all drugs for personal use. The Supreme Court of Argentina already ruled unconstitutional the criminalization of drug use in 2009. In Colombia, the capital city of Bogota is debating an ambitious harm reduction program based on substitution and maintenance. Most Latin American countries have decriminalized drug use and possession for personal use, or are in the process of doing it. It seems that no regional meeting or summit can take place nowadays in this part of the world without drug policy debate on the agenda. The 22nd Ibero-America Summit, November 16 – 17 2012 in Cadiz, Spain, bringing together the heads of state from Latin America, Spain and Portugal, is no exception. Drug policy and the fight narco-trafficking will be front and center at the meeting of interior ministers. Drug policy reform is clearly on the move, and as I predicted in my book “world War-D”, Latin America is taking the lead. The battle is far from over though and there is a long and arduous road ahead of us. Although they have been toying with it for a while, the heavyweights, Colombia and Mexico, are still on the sideline. Mexico for one, is caught in a time warp since the July 1st presidential elections and up to the December official transfer of power. Caught in his own controversies, President-elect Enrique Peña Nieto has mostly kept silent, trying to stay out of the limelight and sticking to non-controversial issues. Petitions of support of Guatemalan president Otto Perez Molina http://signon.org/sign/support-guatemalan-president. If you haven’t done so yet, please sign these petitions. Help spread them through social networks and emails. If you agree with our views, please share this post to support our cause. Send it to at least 5 of your friends, post it on social networks, on your blogs, etc. Previous Previous post: Colorado, Oregon, Washington or … Uruguay, who will be first?